Suit up in a huge foam filled body and transform into a skilled wrestler! Get inside our Sumo Suit rentals and get ready for the funniest style of wrestling known to man. These are foam-filled Sumo Costume suits, complete with the Sumo-style Wig Helmets designed for safety, and the Miwashi belt (A.K.A. = Diaper). Half the fun is looking like a 300 pound sumo wrestler! Here are the rules: Both contestants take off their shoes, don the sumo wrestling suits and wig helmets, and take their place at opposite sides of the wrestling mat. At the direction of the game supervisor, the two sumo wrestlers face-off for the challenge. The contestants try to push, pull, knock-over or wrestle the other opponent off the wrestling mat. However, most the time, the sumo wrestlers just have fun bumping and throwing their huge, fat sumo-bodies into each other with laughter and cheers from the crowd. Audiences have as much fun watching as do the participants, making this a great rental for any party or event! 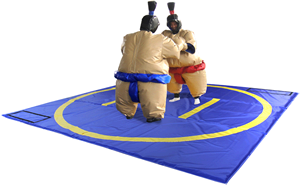 We use industrial grade foam suits instead of inflatable sumo suits because of manufacturers years of experience that foam suits are superior in participant safety. Foam sumo suits are also easier to put on, and take off; making this interactive game have a much higher turnover rate of players. These suits are surprisingly light weight, and are a one-size-fits-all for teenagers (not suitable for children shorter than 5’4″) to adults.